In first SlOkam, as a person who sets out to praise some one, he will praise that person’s wealth, and since for a vaishNava, his real wealth is gyAnam (knowledge) and vairAgyam (detachment), ALavandhAr salutes nAthamunigaL‘s excellence in both of them. It is said in mudhal thiruvanthAdhi 43 “thanamAya thAnE kai kUdum” (wealth such as paramabhakthi etc will occur themselves), that for a vaishNava, bhakthi etc are the wealth. I offer my salutations to nAthamunigaL who is a collection of incomprehensible, amazing knowledge and detachment which were easily attained (by the grace of bhagavAn), who meditates upon bhagavAn and is an ocean of deep devotion towards bhagavAn. nama: – ALavandhAr is saying “I am not for me; I am a servitor of periya mudhaliyAr (nAthamunigaL)” as said in “ahamapi na mama | bhagavatha EvAhamasmi …” (nama: is said to be the bestower of the thinking “I am not for me; I am a servitor of bhagavAn”). As said in vishNu shadaksharI [vishNu manthram] “namO vishNavE“, ALavandhAr says “namO nAthAya” out of gratitude. This is common practice as seen in “namO vishNavE“, mahAbhAratham SAnthi parvam 344.45 “nama ithyEva vAdhina:” (The definition of the residents of SvEtha dhvIpa applies to the mukthAthmAs (liberated souls) as well. They are always performing anjali (joined palms out of reverence); they are blissful as a result of that; they constantly recite “nama:“), yajur AraNyakam 4 “nama rushibhyO manthrakrudhabhya:” (I salute the rishis who have realized the manthra), vishNu dharmam 90 “thEshAmapi namO nama:” (I salute those who salute yagya varAha bhagavAn). 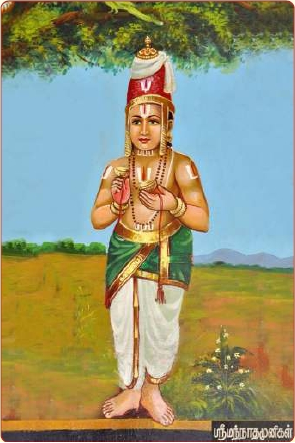 Since ISwaramunigaL (nAthamunigaL’s father) auspiciously named him SrIranganAthan, he came to be known as nAthan. With the desire to explain such nAthamunigaL’s nature, ALavandhAr proceeds further. achinthya – implies that we cannot think that nAthamunigaL‘s knowledge etc are like some one else’s [there is no comparable person to him]; also, explains that even most knowledgeable person cannot estimate his qualities such as knowledge etc. adhbutha – since previous iyaththArAhithyam (inability to measure/determine) is explained, here it explains that for one who understands his qualities within their ability, his knowledge etc are enjoyable [amazing]. aklishta – Unlike vyAsa et al who acquired their knowledge through self efforts, since his knowledge etc were acquired by the grace of bhagavAn as said in SrI bhagavath gIthA 10.10 “dhadhAmi budhdhiyOgam tham” (for those who are desirous to be with me always and worship me, I lovingly bestow the knowledge to reach me) and in thiruvAimozhi 1.1.1 “mayarvaRa madhi nalam aruLinan” (bhagavAn blessed me with faultless knowledge and devotion), there was no difficulty [in acquiring them]. gyAna – gyAnam (knowledge) is knowing about thathva thrayam – chith (sentient entities), achith (insentient entities) and ISwara (God). That is, knowing that AthmA is exclusive servitor of ISwara, achith is to be given up and ISwara is the controller of both. gyAnam means knowing this aspect; It is explained that any knowledge other than on bhagavAn, only leads to disaster and is very lowly as said in SrIvishNu purANam 6.5.87 “thath gyAnam agyAnamathO’nyadhuktham” (That which leads to supreme lord is gyAnam; everything else is agyAnam (ignorance)) and SrIvishNu puraNam 1.19.41 “vidhyAnyA SilpanaipuNam” (that which leads to mukthi is gyAnam; everything else is as good as stitching sandals [just a skill to get a task completed]). vairAgya – As a result of this distinguished knowledge, one would be desireless in anything other than bhagavath vishayam. periya thirumozhi 6.1 “vENdEn manai vAzhkkaiyai” (I don’t want the householder’s life). rASayE – rASi means collection/group. gyAna rASayE – vairAgya rASayE – While gyAna and vairAgya are mentioned in singular, why is there a mention of “rASayE” (collection)? Since bhagavAn’s svarUpa (nature) etc [rUpa (forms), guNa (qualities) etc] are many, the target of knolwedge is also many. As said in vihagESvara samhithai “pitharam mAtharam …” (Oh bhagavAn! I give up my father, mother, wife, children, relatives, friends, teachers, wealth etc with the traces and surrender unto your divine feet which measured the worlds), since there are many aspects to be given up – collection of vairAgyam is also applicable. It can also be said that all the knowledge and detachment of wise people are contained in nAthamunigaL’s knowledge and detachment. This can be seen in chAndhOgya upanishath 4.1.4 “yath kinchith prajAs sAdhu kurvanthi yasthadhvEdha yathsa vEdha sa mayaithadhuktha ithi” (whatever good deeds performed by anyone, they are found in raikva; whatever is known to raikva is what everyone else knows. Such raikva is spoken by me now) and in SrIbhAshyam 1.3.33 “lOkE yathkinchith sAdhvanushtitham karma yachcha sarva chEthanagatham vigyAnam thadhubhayam yadhIyagyAnakarmAnthargatham sa raikva ithi Aha” (All karma (good deeds) and gyAna (knowledge) of the world are seen in one person and that person is raikva). munayE – As said in SrIvishNu purANam 1.17.39 “na vivEdhAthmanO gAthram” (That prahlAdha who was bitten by deadly snakes and having his mind focussed on krishNa, due to being situated in blissful meditation of bhagavAn, did not realise his body) and “paSyannapi na dhrushtavAn” (Not seeing while seeing), constantly meditating upon emperumAn who is to be meditated upon. periya thirumozhi 9.3.3 “Edhu seydhAl maRakkEn mananE” (What will make me forget you? [I cannot forget you]) and thiruvAimozhi 5.3.5 “en nenjam avan enRE kidakkum” (my heart is always attached to him). When he was meditating upon krishNa, even the king’s arrival did not disturb him. agAdha bhagavath bhakthi sindhavE – While bhakthi is a tranformation of knowledge, it is separately highlighted to explain the abundance of that and the importance of that. bhakthi is anububhUshai (desire for affectionate engagement) as said in linga purANam uththara bhAgam “snEhapUrvam anuidhyAnam bhakthi:” (repeated friendly meditation is called bhakthi) and “svAmini dhAsasya snEhamayI sthithi:” (the state of friendship of a servitor towards his master). The term “bhagavAn” (bhagavath) indicates emperumAn’s form in paramapadham. He remains with all six qualities [gyAna, bala, aiSwarya, vIrya, Sakthi, thEjas] in perfection as said in “vAsudhEvO’si pUrNa:” (You remain complete with six qualities). agAdha – akshObhya (unshakeable). Another meaning – cannot be measured; no one can be steady in it. sindhavE – thiruvAimozhi 7.3.6 “kAdhal kadalin migap peridhu” (my love for you is greater than the ocean) and periya thirumozhi 4.9.3 “Asai ennum kadal” (the ocean of desire), while ISwara himself cannot be steady in it, he is immersed in it. This entry was posted in Other, sthOthra rathnam on December 14, 2016 by Sarathy Thothathri.